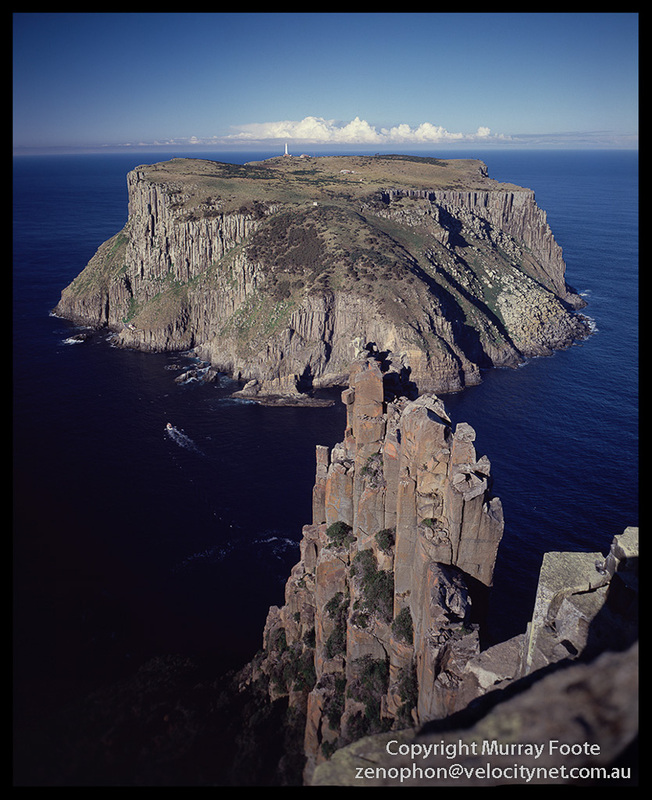 The 27th and 28th of July 1987 was perhaps the apex of my Public Service career because I was able to undertake two days of bushwalking on full pay, photographing Tasman Island. Sunset was at five and I took some images then with the Rolleiflex but I don’t have those. The first three here are successive images after sunset. 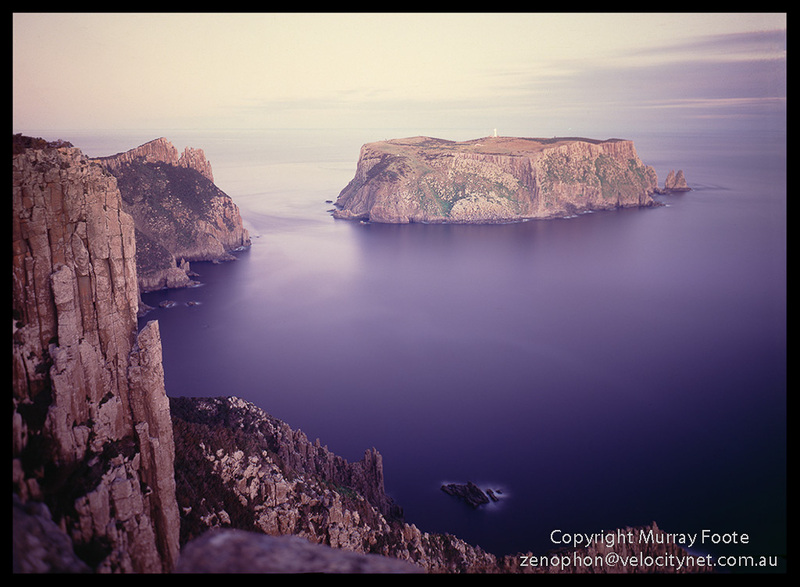 Tasman Island, guarding the entrance to Storm Bay, was a late arrival as a lighthouse being built in 1906. Contact with the mainland was by carrier pigeon, which could be hazardous for the birds. Due to the exposed nature of the lighthouse, wind-generated powed was trialled in 1975 and this led to automation of the lighthouse in 1977, one of the first to be automated. The Tasmanian Office insisted on sending a minder along “for my safety”. My preference for the night was to sleep on the narrow path at the top of the cliffs so I could be in position at dawn but this was not to be. My minder friend would have had conniptions if he had seen where I took this photograph at 10 AM the next morning. I was on the edge of a sheer cliff and I let myself down into a little ledge with drops of 600 or 800 feet on both sides. The image does illustrate well some of the important characteristics of the island though and you may wish to click on it to see it larger. You can see the small boat like a tug in the water. 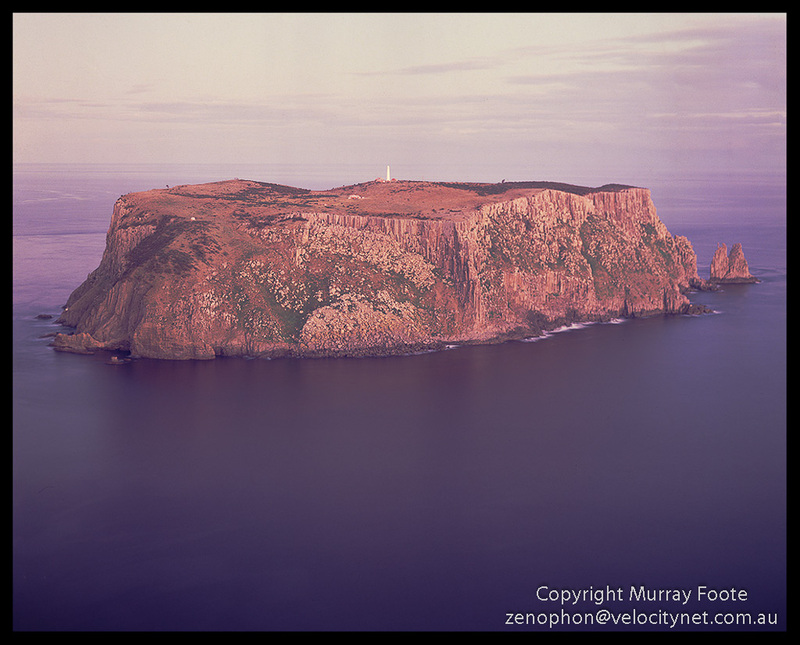 It’s heading towards a rock that is just before the left-hand corner of the island. From that rock there is a flying fox that goes up to a landing and a small building. You can actually see the wire on the full-sized image. Before the advent of helicopters that was the only way on or off the island. Beyond the landing there is a way or Cornish wooden railway. At the top you can see a small white building. That was a capstan where a team of horses or bullocks dragged the cars up or down. All building materials as well as all people got onto the island that way. One lighthouse keeper’s wife told me of one occasion when they were slowly being dragged up and had almost got to the top until the horses or oxen got tangled up and started going the other way round. They slowly went backwards all the way down to the landing. To get into the flying fox, you had to jump into the basket at the top of the wave and time it precisely. Another keeper’s wife told me that having got onto the island via the flying fox and the wooden railway, she vowed never to make the journey again until she came to leave. The keepers got holidays from time to time but she just stayed on the island. 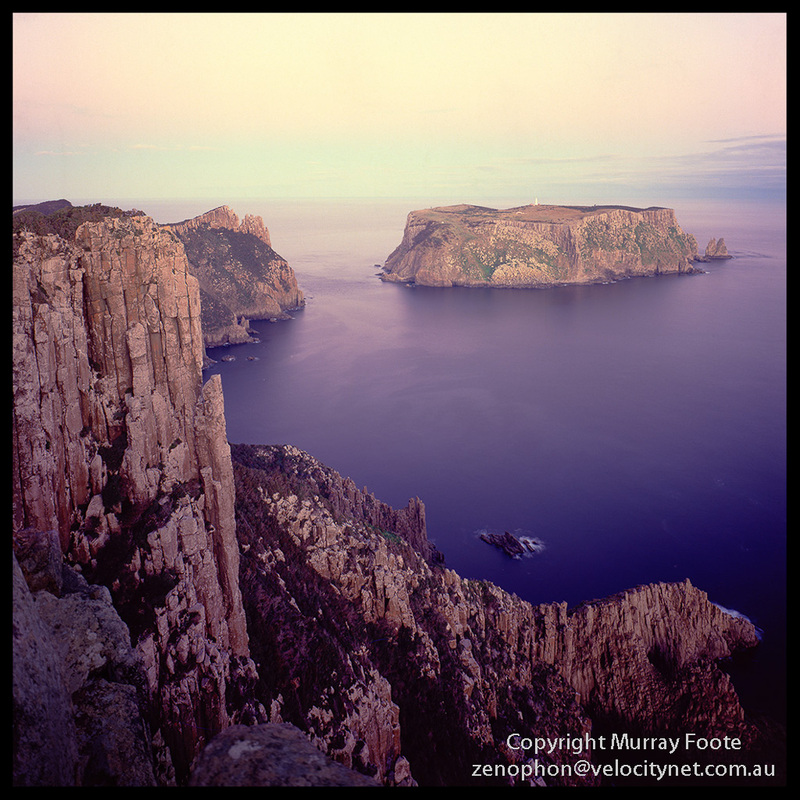 This entry was posted in Australia, From Dusk Till Dawn and tagged Architecture, Australia, History, Landscape, Lighthouses, Photography, seascape, Tasman Island, Tasmania, Travel. These are more great images of the series. Have you considered putting them together into a book using a book on demand provider like Blurb? They offer nice quality and you don’t have to print a lot of books without knowing if they ever sell. It would be a pity, if these images just stay in your drawer. Thanks Christian. I will have to consider that at some stage but I’ll barely finish the series here before taking off on the next big trip to the North Atlantic.